Ang Thong Marine Park, the inspiration for Alex Garland's screenplay, 'The Beach'. Amazing rock formations, coral reefs, caves, deserted beachs, an inland emerald lake to explore, swim, kayak, or chill on the beach. If you do any tour, this is it. You can choose from many different types of tours to the marine park, most involve similar schedules, swimming, kayaking, checking out the ermald lake and some beach time. Issues to consider are how many people you want to travel with, type of boat and level of luxury. Some operators will run VIP charters with just you and your friends, minimum and maximum numbers vary between operators, usually reflected in the cost. 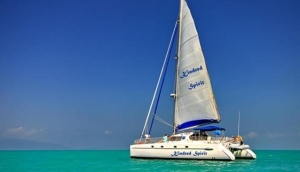 You can also charter speedboats with your own custom itinerary, check the options here.